A half shell / of its former self / since life left. Twoku: Now just half the shell / it used to be emptied of / the life that left it. Threeku: Half the shell / that fell after it / released life. 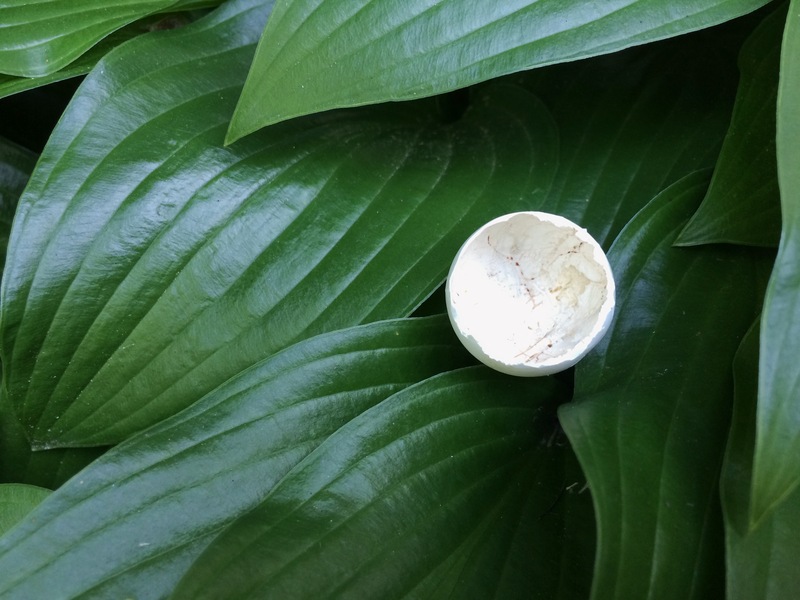 Forku: One half an eggshell / came to rest on dark green leaves / after releasing life. 13 Jul	This entry was published on 2014/07/13 at 2:25 pm. It’s filed under Animals, Haiku, Life+Wisdom, Nature, Summer and tagged bird, birth, egg, empty, Haiku, haikugrams, haikumages, half shell, life, parenting, poem, poetry, purpose, release, shell of its former self. Bookmark the permalink. Follow any comments here with the RSS feed for this post. Older: The clover / does not care if it / has four leaves. Newer: Pulling weeds left too / long, they release their seeds and / taunt me as they die.